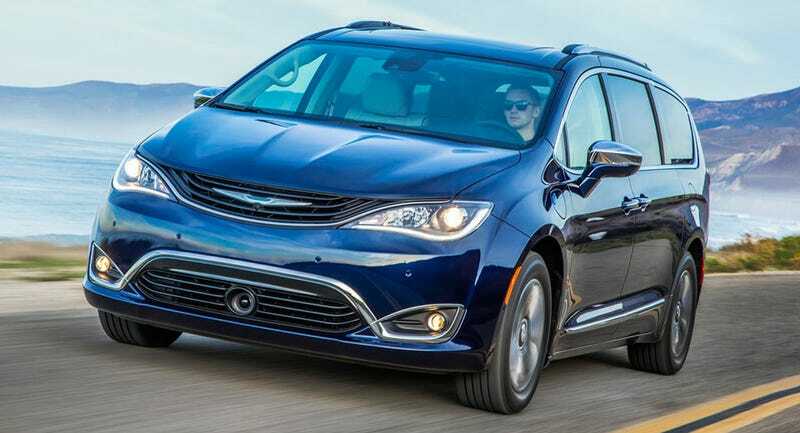 For those of you smart enough to realize that the minivan is a far superior vehicle for family duty than a crossover, the all new Chrysler Pacifica is a nice place to be. The Pacifica Hybrid is now available for order, and there’s more fun news: it could end up being cheaper than the gas version. The Pacifica Hybrid combines the 3.6-liter V6 with a plug-in electric hybrid drive system that can deliver up to 30 miles of driving on the electric motor alone and up to 530 miles of total range. Chrysler claims the Pacifica Hybrid will get 80 miles per gallon equivalent (MPGe) in city driving. That is incredibly efficient for such a large vehicle, and should make for a great road-trip car. The minivan comes in two flavors: Pacifica Hybrid Premium, with an MSRP of $43,090 and Pacifica Hybrid Platinum at $46,090. Here is where the math gets interesting. A Pacifica Hybrid Premium is the equivalent, features wise, to the gas powered Pacifica Touring L, which has an MSRP of $35,490 including destination. When you subtract the $7,500 federal tax credit from the Hybrid Premium’s base MSRP of $35,590, that puts you within $100 of the Touring L’s price before any additional state or local incentives. Given the Hybrid’s superior efficiency you should save well over $100 a year in fuel costs. So you’ll be paying the same as a similarly-equipped gas Pacifica, except you’ll also be saving at the pump. Now the real bargain is in the Hybrid Platinum. To match all the standard features on the Platinum, you would need to spec out a Pacifica Limited (MSRP $43,490), then add the Advanced Saftey Tec group for $1,995 and the UConnect Theatre and Sound Group for $2,795 for a total of $48,280. That’s almost $2,200 more than the Hybrid Platinum’s MSRP. Factor in the $7,500 federal tax credit and increased fuel savings, and the loaded hybrid Pacifica could result in a net savings of almost $10,000 compared to the gas powered version. If you’re snatching up this minivan—and you might as well, over a lame crossover—the hybrid variant is the one to get. Vans! Vans Are What We Must Drive.